That is how a client described me when I asked for feedback! I love giving people ideas. Talking about your business, how you can grow, develop and market it. Feeding you with helpful information, useful examples and suggesting connections and collaborations you may want to consider. That’s how my Inspiration Injections were born. I ran half day marketing mentoring session, and after one session the clients said I had given them the injection of inspiration they needed. The name stuck because it describes them perfectly. But it is more than that, it’s also how I train, develop strategies and prefer spending my time! I love to inspire others, motivate people and empower them with knowledge, ideas and tips. Thank you for our workshop, I really enjoyed it. I think you bring passion, energy, fun and credibility to your workshops! 2 feathers in my hat! Hats are my thing! If you meet me out networking, I’ll probably be wearing one. 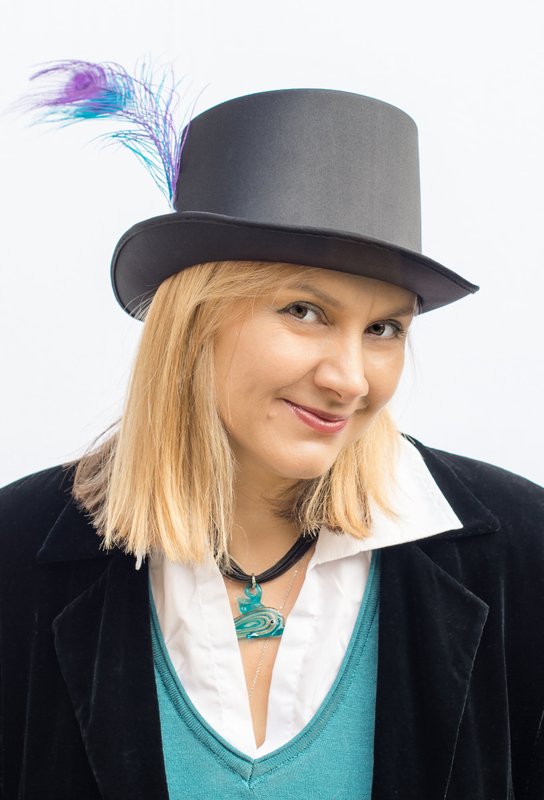 I was at an event when someone walked up to me and asked ‘are you the email lady in the hat?’ A perfect description! Email specialist – developing strategies, reviewing programmes, training and deployment. Idea Generator – marketing mentor’ is the formal description, but to me it’s about ideas, enthusiasm and empowerment. Julie is one of the most knowledgeable people that I know in the industry at the moment. Her way of working and managing people is great and friendly. She is fun and exciting to work with and overall a great person to lead a team of people as she inspires and boosts the morale of everyone on her team. It was a pleasure to work with Julie! With over 20 years’ experience in sales and marketing, I enjoyed the dot com boom (then gloom), and worked with a wide range of blue chip clients as well as some very interesting smaller businesses on direct and digital marketing strategies before focusing on email when I joined Silverpop Systems Inc working as an Account Director and European Consultant. I am a member of the Institute of Direct and Digital Marketing dedicated to providing marketing advice and mentoring that works for you. I have also passed my IDM Award in Digital and Direct Marketing. I chose not to go back to London 5 days a week after having my children. I had a mini career break, picking up a few consulting jobs along the way, but I still had the knowledge, drive and passion that motivated me as a European Consultant. Like many working mums, I wanted a career that fit in with my family life but still enabled me to provide a valuable and professional service. I thought about what I am good and and enjoy. I love marketing – particularly email marketing – and get a buzz from sharing my knowledge and ideas with others. I have worked with huge companies, small businesses and enjoy helping those with a great product or service understand more about how to get it out into the world. The Virtual Marketeer launched in September 2013 as my eldest started school, offering marketing mentoring services for clients as well as strategic email marketing services. Working around my children, I work primarily with local businesses. I also train clients in Email Marketing, and am currently training the Email Marketing Course for the Chartered Institute of Marketing as well as at St Albans Enterprise Agency. I work primarily with clients in Hertfordshire – mainly St. Albans, Welwyn Garden City, Stevenage and Hertford. I also travel into London and provide ideas and inspiration via Skype as well as remote Consulting. I believe in respect and integrity in my professional relationships. I have worked with both large corporate organisations and small businesses, so I am realistic about what can be achieved in different arenas as well as able to adopt a flexible approach. I enjoy a professional but relaxed style of working which encourages collaboration, idea generation and honest feedback without crossing important professional boundaries. I am a home based, working mum so like many millions of women I juggle work and children and so understand the many personal and professional pressures on business managers!